Thumdercracker pen looks messy and i want to up grade it to sonething that will fit in with the dining room. Happy at keeping the cage he uses that as bedroom and bathroom. But the pen part looks unslightly its cable tied together and it also has green mesh at the gaps where it meets the cage. Looking for ideas so he keeps his space but something more sturdy and pretty. Dad thought of putting a boars down and fitting a fence to it but the cost for that is way out of hand. Cheaper the better i have to many big birthdays in such a short period of time. Are you wanting to replace all the wire fencing? Have you thought about Perspex ... something like shower panels. Easy to keep clean, easy to work with and draught proof. That is a super set up hunni. Yes woodwench all the wire fencing getting replaced. Il have a look will need a wood frame for that too. What about using the existing wire panels; cut them and fix to wooden uprights. You could save a lot on wood by just using uprights and cutting the wire panels is easy. 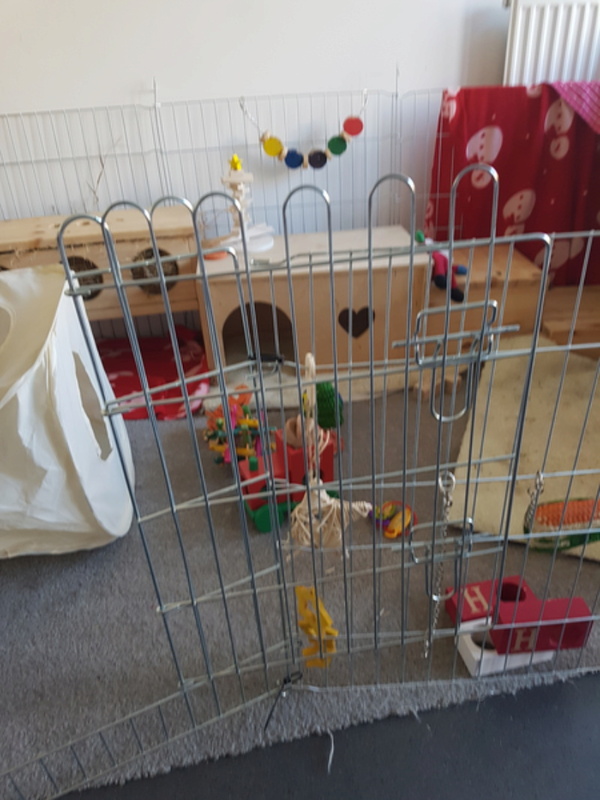 The bunny boarding we use have pens made with wooden frames and perspex. 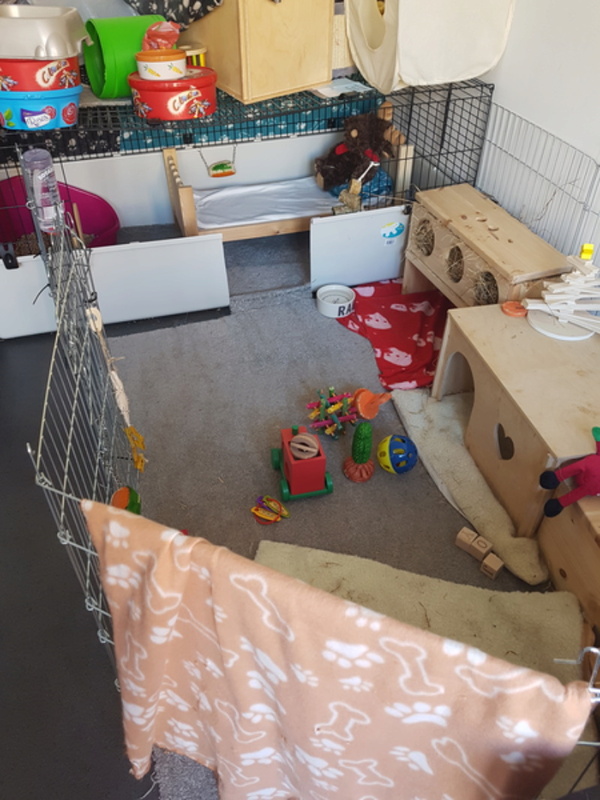 You're set up is fab, i know what you mean about the metal panels tho- our pen is similar- made out of puppy pen panels and we'd like to do the same kind of upgrade to something a little smarter looking! The prob with using the existing ones is there two different dog pens and the wire different would need to remember which ones i had ordered. Was gonna buy the panels of manor pet housing but they are just so expensive. But liking the idea of perspex and the frames. You can see the bunny boarding ones in this album, looks a bit distorted because of the angle but you get the idea. She just bought the wood, got the perspex on ebay and made them herself. Keep us updated, looking forward to seeing the finished product! and maybe getting some hints and tips! Ha ha had a look through and picked a pic to show john showed him then looked at the caption and it was mj and philip. I do like the look of that set up, john now working out how to fit the perspex and frame together. Im sure he mentioning window frames a lot lol. Try fitting like the tongue and groove on wooden flooring. You might find a builder has a lot of off cut wood he would be glad to get rid of. He does Gemma.... he's an houserabbit! Haha Woodwench love, I suppose he does LOL! I saw a nice one on the another forum facebook group very similar to the elmbank ones but the girl had used wire mesh instead of perspex. Said it cost £102 for the materials. It wont let me see the post, must be private. Plan wont be able to.start anything at the moment. 3days not at work = 3days off no pay. I just use wire mesh for my bunny.